Updated Tuesday April 14, 2015 by Dan Fournier. HFA Spring Director, Cartier Shields and players were at the Ticats Head Office at 1 Jarvis today to receive a cheque presented by the Hamilton Tiger-Cats represented by #68 Mike Filer and Pioneer Play Action representative Cheryl Stubbs. HFA is the proud recipient of the Pioneer Play Action Energy Bonus Buck Challenge Contest that was run last year and received $5000. Thank you to all members who used their Play Action Cards at Pioneer gas stations - this will help lead to a great experience for our kids! 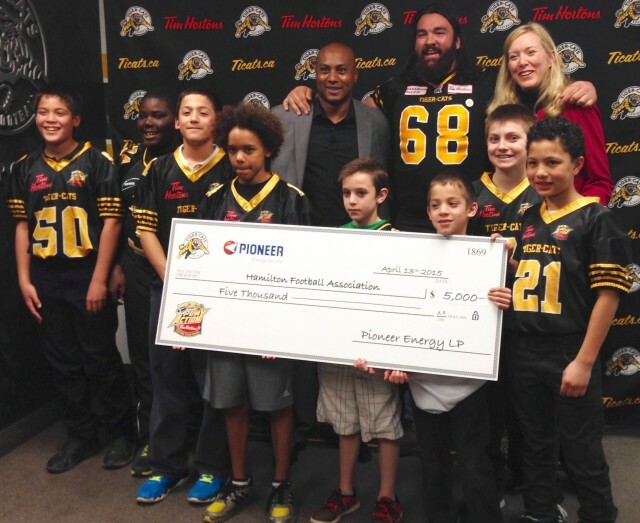 We also thank our partners the Hamilton Tiger-Cats and Pioneer Energy and the Play Action Program for supporting minor football and helping HFA develop the next generation of hometown Ticat greats!